These are songs to listen to when you’re lying on a blanket on a grassy knoll (not the kind you sit on and wait to kill someone) and stare at the clouds pass by. Not that the weather is especially conducive to this at the moment but, hey, I can dream about autumn approaching, can’t I? Andrew Bird’s “Imitosis” is pleasant to lounge around and listen to and makes you feel smarter while doing it. The guy has a vocabulary, there is no doubt about that. This video is also pretty cool. Rodrigo y Gabriela make me wish that I knew how to play the guitar. There is no reason for words when you can play as amazingly as this. This song, “Tamacun”, is one of my all time favorite songs. Starfucker, whose name I hate but sound I love, has a good thing going with “Bury Us Alive”. 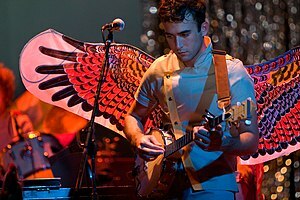 Sufjan Stevens, whose deceptive name is synonymous with indie music, has been around for a while. I’m a new convert, having only really gotten into his most recent album The Age of Adz. “Vesuvius” is one of my favorites from that album. If you really wanna chill under the sun and stare off into the clouds, listen to “Impossible Soul”. It’s 25 minutes long and is fun to listen to on occasion.